I tossed around the idea of numerous different names for this cupcake. None of them really rolled off the tongue. It seemed imperative to mention all of the key ingredients, as each plays such an important role in the deliciousness. But since I couldn’t find a way to use all of them, I used none. 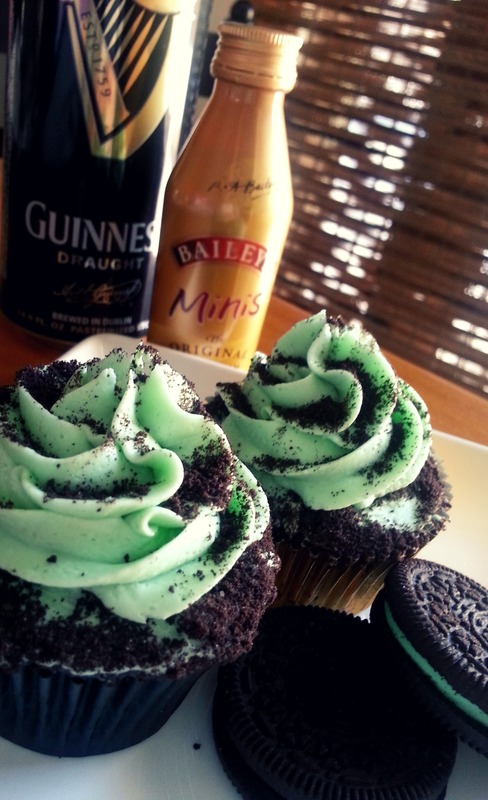 Thus, The Ultimate St. Patrick’s Day Cupcake was born. Once again, I’m a little late at posting this recipe for you to actually make it for St. Patty’s Day, but I assure you, these are a tasty treat for any time of the year. You start with a Guinness chocolate cupcake. You fill it with fresh Bailey’s Irish whipped cream. 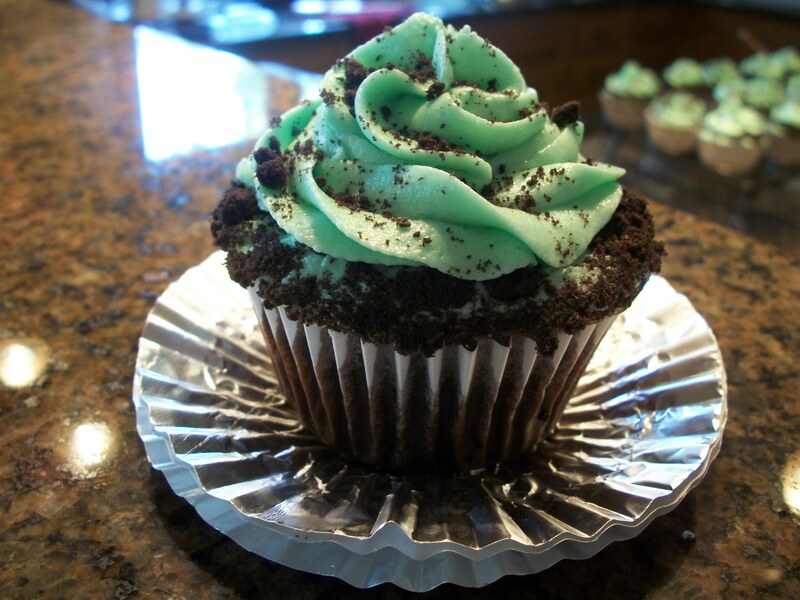 And you top it off with mint buttercream frosting and crushed Oreos. And then you swoon a little. Or do an Irish jig. Before you do anything else, you’ll need one package of Cool Mint Oreos. Separate cookies from creme filling of 24 cookies. Set creme filling aside, finely chop cookies in a food processor. Take half of the ground cookie crumbs, mix with 1 tablespoon sugar and two tablespoons melted butter. Place about one teaspoon of crust mixture into prepared cupcake tins, press down with the bottom of a shot glass to create a “crust”. Bake at 350 for 5-8 minutes. Sift together cocoa powder, flour, sugar, baking soda, baking powder, and salt into a large bowl. Add eggs, Guinness, buttermilk, oil, and vanilla. Mix until smooth, about 3 minutes. Scrape down the sides and bottom of bowl to assure batter is well mixed. 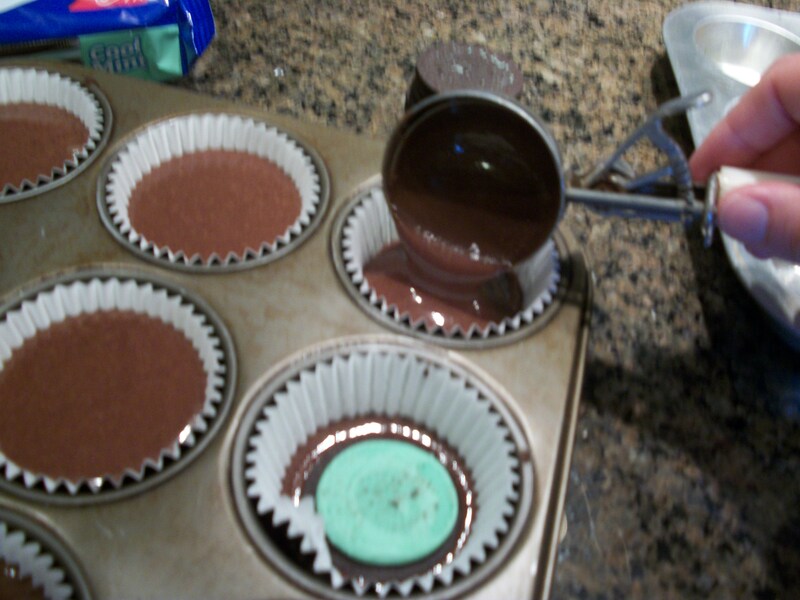 Divide batter evenly among prepared cupcake crusts, filling each 2/3 full. Bake for 18-20 minutes, rotating pan once if needed. Transfer to a wire rack; let cool completely. Place ingredients in chilled metal bowl of electric mixer. Whip on high until soft peaks form. Cream together whipped cream, mint creme filling, and butter, in the bowl of an electric mixer fitted with paddle attachment. It might turn sort of “wet” and lumpy at first, just keep mixing. Add powdered sugar gradually, until smooth. Add green food coloring or peppermint extract to intensify color and flavor, if desired. Additional Bailey’s or milk may also be used to reach desired consistency. 1. Place whipped cream in piping bag, fitted with any large tip. Place tip in center of cupcake and squeeze in whipped cream until cupcake starts to sort of “burst”. 2. 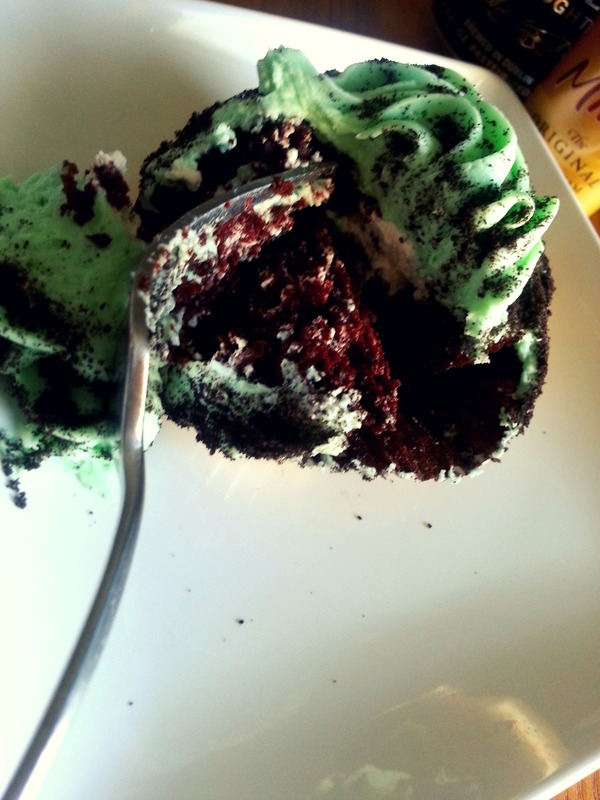 Using a bread knife, spread small amount of mint creme frosting on outer edge of cupcake (around filling hole). Roll frosted cupcake edge in remaining Oreo crumbs. 3. Place remaining frosting in piping bag, fitted with large star tip. Frost as desired, sprinkle with Oreo crumbs. And then a few seconds later, like this. 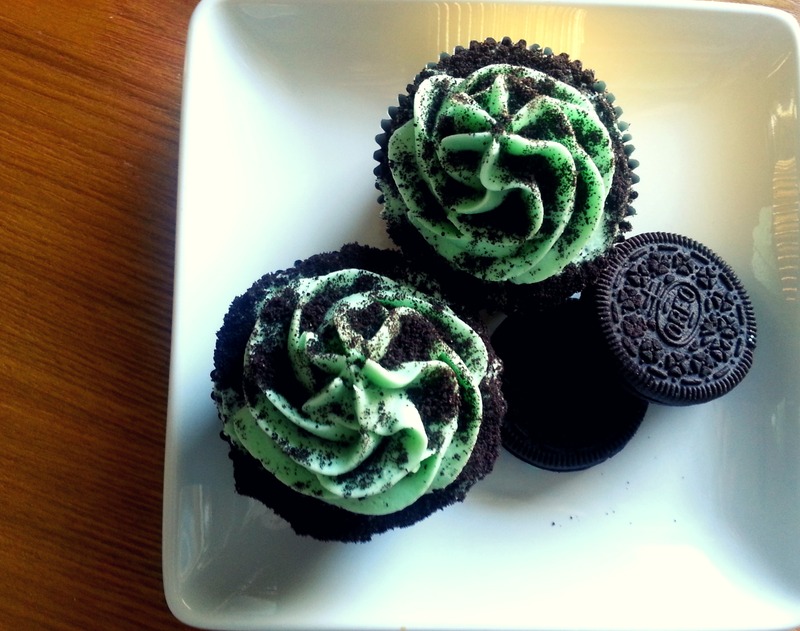 If you want to try a slightly less complicated but equally tasty version of these cupcakes, you could do this. Make the same cake batter. You can swap Guinness beer for warm water, if desired. Drizzle enough cake batter into prepared liners to cover bottom of liner. Place one half of Mint Creme Oreo (the half with the creme attached) on top of batter, then top with more cake batter. Like so. Follow same baking and cooling instructions as above. Don’t skip the frosted edge dipped in Oreo crumbs part. And definitely don’t skip the frosting part. There you have it. 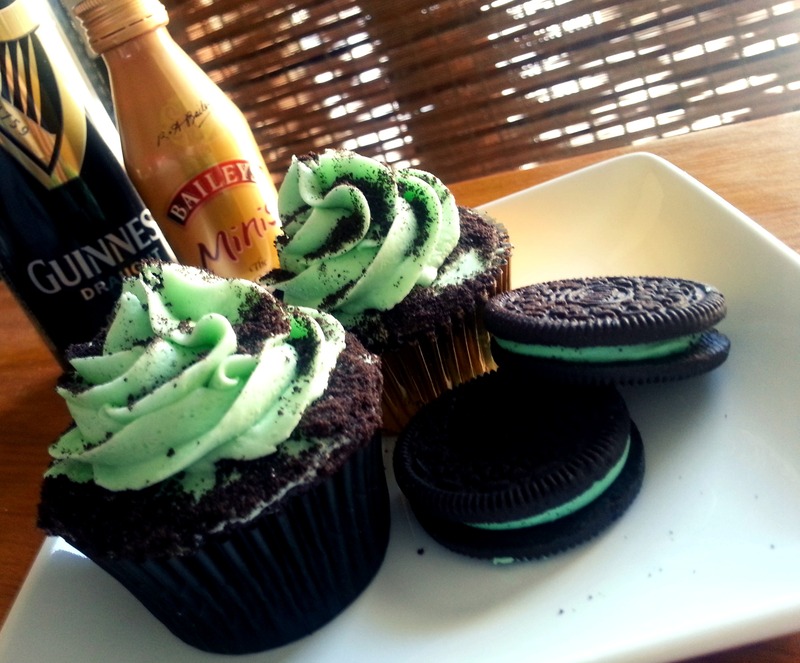 The Ultimate St. Patrick’s Day any day cupcake. Two ways. Those look really great! My massage girlie was telling me she made these on Saturday! Yum!! Wow those sound sooo good! I wish I could bake. I’m sure it would be a disaster if I attempted this!